The dust has settled, and we have some brand new World Champions to introduce to you! Um Paul of South Korea and Michalis Dimitrakopoulos of Greece fought off stiff competition battling through the final round to become the 2016 World Latte Art Champion and World Coffee in Good Spirits Champions! The World Cup Tasters Championship final was a tight competition as always, with Gabriel Céspedes of Costa Rica triumphing for a record second year in a row! Fun fact: he scored a seven out of eight cups in the final round—which was only his second time ever missing a cup in competition. 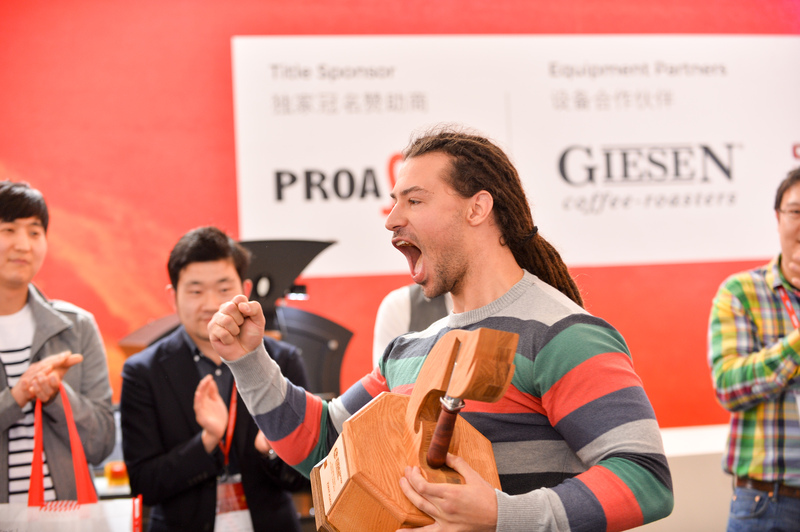 In the World Coffee Roasting Championship, brought to you by Proaster, Alexandru Niculae of Romania triumphed through incredibly tight competition. Check out his winning roast profile here. These events happen thanks to the support of our sponsors, and especially our Qualified Equipment Sponsors: CMA Astoria, Anfim, Cafetto, Pentair, and Technivorm. With their help, World Coffee Events (WCE) put on three simultaneous stages of world-class coffee competition for the more than 150,000 people who came through the HOTELEX Shanghai show. We couldn’t have done it without an army of amazing volunteers, the incredible support of our host UBM Sinoexpo and our production crew LSFX, and an amazing crew of dedicated Judges. The Chinese and international crowd at this year’s competitions was incredible, bringing enthusiasm and support at every stage. Hearing the call, Chinese competitors placed very strongly this year, with Qi Li taking 2nd place in the World Latte Art Championship and Hu Ying taking 5th in the World Coffee In Good Spirits Championship. This year’s events also featured multiple interactive audience elements, including the Marco Beverage Systems Brew Bar where guests could sample a wide variety of local and international coffees, as well as do their own triangulations of the Cup Tasters competition coffees. Over at the Proaster Coffee Roasting stage, competitors’ production coffee roasts, coming off the Giesen roasters, were on offer. At the Latte Art and Coffee In Good Spirts stage, everything from serious amounts of passerby espresso production to a Master Class by Spirit Sponsor Grand Marnier were happening—including perhaps the most captivating of the events, the art bar portion of the Latte Art competition, where the competitors first poured the reference designs they’d try to replicate the next day. Thank you again to all of our sponsors, and we can’t wait to see you in Dublin, where World Coffee Events will be putting on the World Barista Championship, World Brewers Cup, and Re:Co Symposium. About World Coffee Events, Ltd.
World Coffee Events’ mission is to develop events that engage the specialty coffee community and promote coffee excellence. Founded in 2011 by joint cooperation of the Specialty Coffee Associations of Europe and America, World Coffee Events is the premier producer of events for the coffee community and licenses more than 60 championships involving thousands of participants worldwide. For more information, visit our website at https://www.worldcoffeeevents.org.